This film, like "Adams" with Paul Giamatti and Laura Finney, is an historical docu-drama. But it is also the story of a marriage. At the same time as Germany was gearing up for war, a once powerful Winston Churchill, played by Albert Finney, has, by 1934, been reduced politically to a joke. He is hooted and booed on the floor of Parliment, and seems lost in his efforts to awaken a pacifist population to the gathering storm. When Clementine, played by Vanessa Redgrave, goes on a cruise for four months, he is challenged as he has never been before, both politically and emotionally. 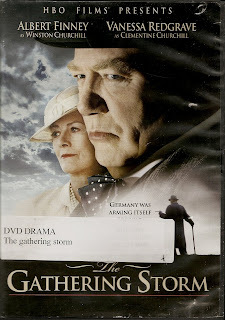 At the same time this is also a bit of a spy story, as Churchill attempts, through a "backdoor" channel into the Foreign Office, to gather all the facts and figures he needs to turn around a Parliment, and a King, who seem oblivious to their own looming destruction at the hands of the Nazis. Through his efforts, which almost wrecked his career, he was able to awaken the people, barely in time to mount an adequate defense against Germany, thereby saving England, while ascending to his coveted role as Prime Minister. He would hold this post throughout the war. A well written, and directed film that takes a "peek behind the curtain" and gives the viewer a look at the ordinary aspects of life, and the relationships, which sometimes help to shape world events.